We’ve moved all the update logs over to MappSnap. That’s where the MAPP program will be housed from now on. Here’s the Public Link, but we are still working on passwords and security to the User Side. Naturally, the Private Side has all the “deal” data and controls. Update on September 20, 2016. Last week, we signed a contract to put part of our data online for registered users to see. 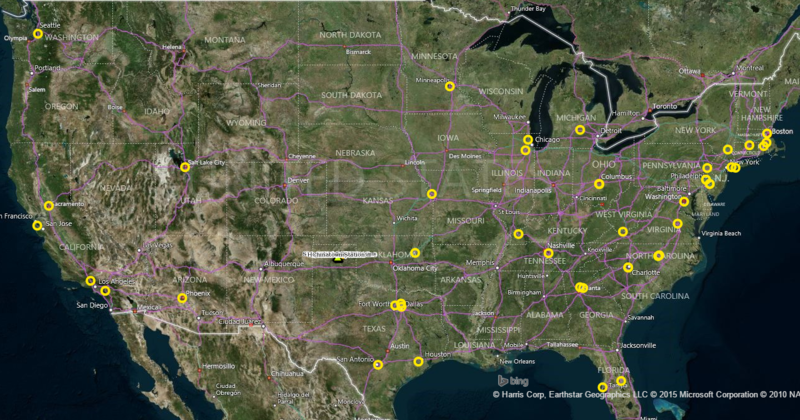 We will start with our annotation and media layers that will focus on Big Industrial in major US markets. The big challenge will be getting Occupiers to use the site because they are the drivers of the entire industry. At the same time, we need to have enough space offerings for Occupiers to find the site useful. For now, we’ll only be working on development deals where Occupiers are necessary for financing. Space Sharing is also important because if we can line up two or three tenants for a big building, scale economics will be benefit everyone. Please keep an eye open for log-in information by year end. So far this year we have held off adding any more features to the MAPP Program and instead have been working strictly with the data. There are several predominant trends in this market and we are using data analysis to identify the Occupiers and Landowners who will benefit the most. In every major market there are severe space shortages and rents are surging. Many large warehouse and distribution operations can no longer afford to operate close-in, central locations, especially when you can move to a newer building in the Western Inland Empire and acquire 50% more space for the same price. 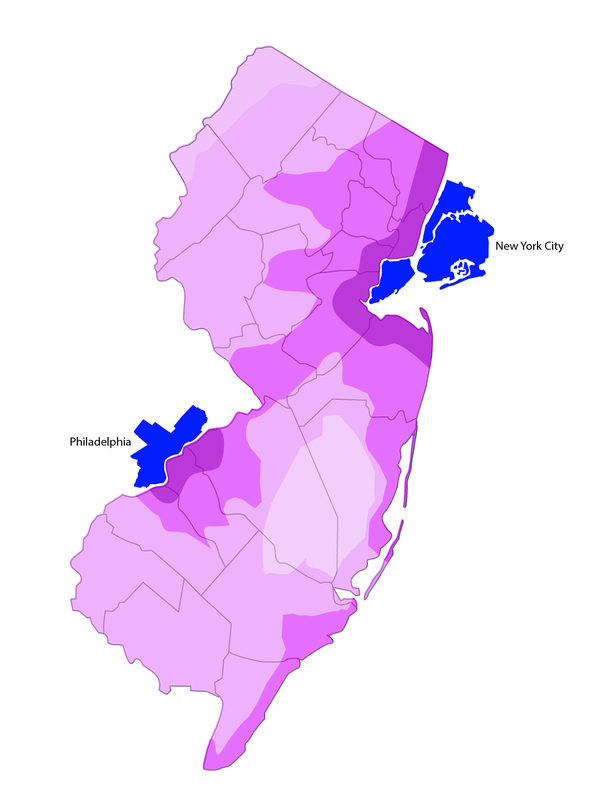 The same conditions apply to the Bay Area, Dallas, Miami and New York/ Central New Jersey. By using basic commands we can search our data to find those companies most likely to benefit from these market conditions and at the same time identify Greenfield landowners who have the perfect development sites. In other words, we find the Occupiers who want new buildings and locate the land where they can build. Without getting into too many details, we’ve isolated several variables (size, location, industry, ownership, zoning) and by coding for those properties, we can make certain matches that would be impossible without large data sets. It’s very simple logic but becomes more complicated when adding new data. Unfortunately, it has taken longer than I thought because finding talented data scientists is difficult. We’ve come to realize, you can actually do very little and achieve excellent results. Meanwhile, we have discovered the MAPP Program works well on mobile devices and is a perfect reference tool in the field if you want the ability to identify locations on the fly and record them for later. The newest addition to the MAPP Program is a BatchGeo application that can take a list of properties from one large owner, an occupier, or an investor and immediately display ther locations on the map. This makes it easy to compare leased vs. owned properties and see the markets where their properties are loacted. We have also written a script that automatically returns the ownershp information for any given address. It automates a process that would normally take much longer by hand. Here are a few examples. We have also started scraping ownership data in major markets. We have a script to simplify the process that would normally be done by interns. In tandem with the MAPP Program we are able to scrape the data for all Big Industrial nationwide for Property Owners, Occupiers, Land, Land Developers, and Investors. We’ve been able to create a large database we use to find off-market properties, vacant land for development, opportunities for investors to purchase. In many cases we can bring the Occupier forward at an early stage to minimize developer and investor risk while at the same time giving Occupiers a below market deal. By using the data and particularly targeting land and land development, there are many ways to structure investments in Big Industrial. 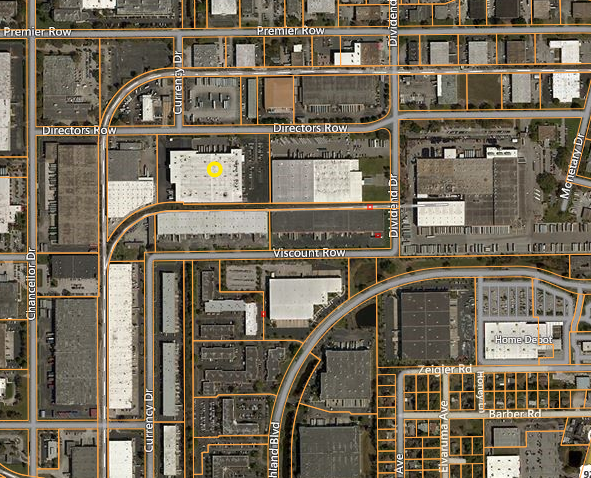 It’s this data – mostly large industrial properties and occupiers – that serve as the basis of our marketing efforts. All records are stored and updated in one place. We are also able to produce some limited analytics at this time. 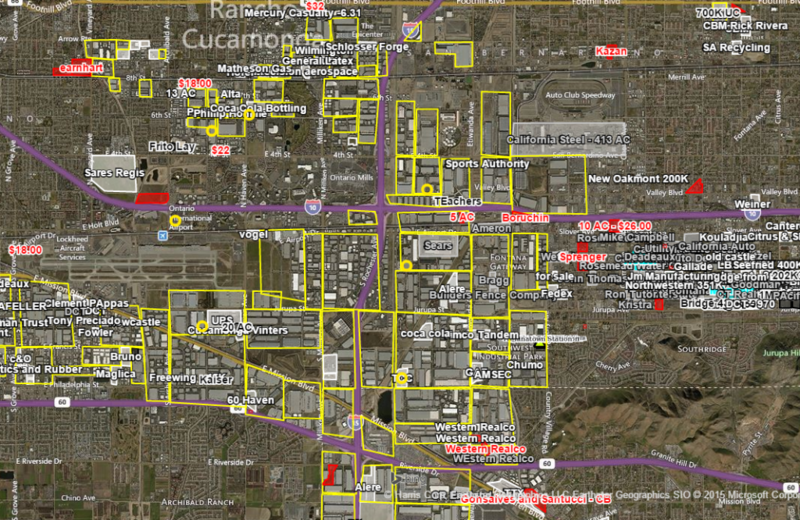 Our main goal is to get the word out that we can find Big Industrial deals nationwide. We’ve added a new feature to the MAPP Program. We can now annotate directly on the map with either shapes or text. 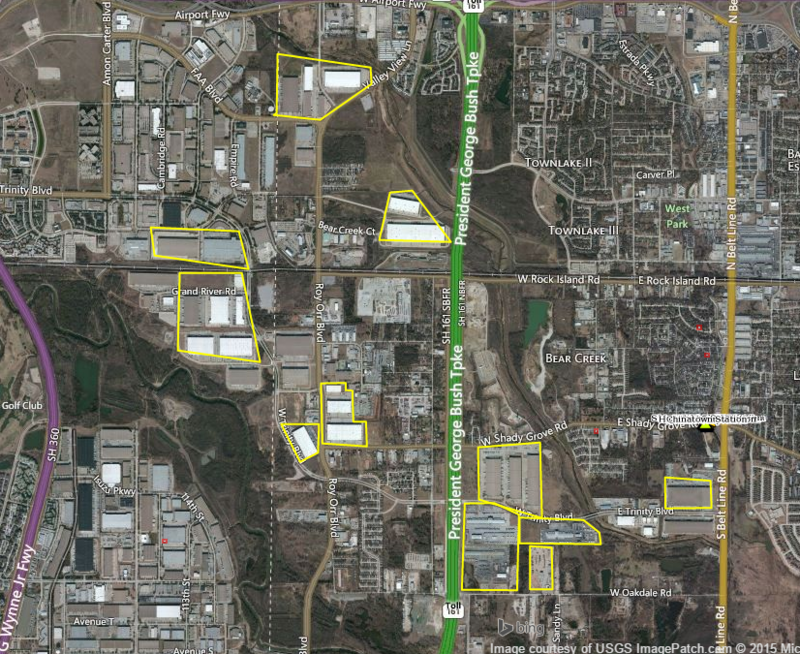 I’ve been doing land maps like this one around the country identifying large industrial parcels not yet developed. This is an easy way to learn the market and show what’s happening. I was at DFW not long ago and the connecting flight was cancelled. I persuaded the airline to book me the following day. In the meantime, I took what few big box listings I had and mapped them out to find where all the big industrial is located particularly new development. 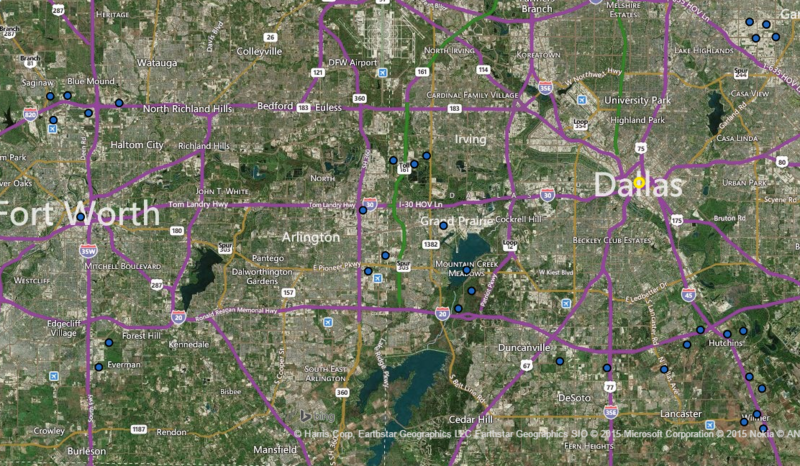 With my cell phone camera I drove around the greater Dallas area and geo-tagged all the locations. I think I did a pretty good job and probably caught 80% of the market. Not bad for less than a day. Below are the points I created. When you click on the dot it opens up the picture I took that also gives the x/y location. This picture is at Mountain Creek Parkway, one of the more beautiful industrial parks I’ve seen next to Mountain Creek Lake. Finally, I moved over to Grand Prairie because it is more built-out and a better area for demonstration purposes. I can highlight the parcels I want and export them into Salesforce to add to my large database of Big Industrial. All these steps combined create a pretty good way to find deals. I can do this almost anywhere in the US and soon to be getting the data for Europe. Below is a recent trip to New Jersey I did over the winter looking for new, Big Industrial. This is a great tool to find deals. But another use is looking for ecommerce sites that are close to large package delivery depots and population densities. Speed and density are a couple of the primary data points when looking to situate ecommerce warehouses. 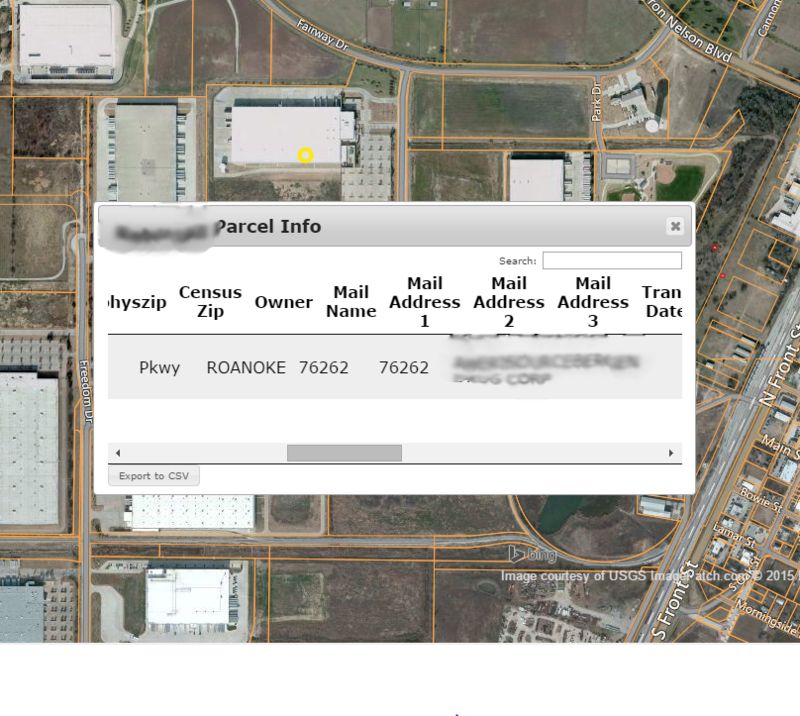 Just acquired an API to give the MAPP Program parcel data for most of the U.S. Helps me find Big Industrial anywhere you want to be. Focus is mostly on large industrial land and buildings. Creating a database of large sites. We’ve added a zoning layer to San Bernadino and Riverside Counties. 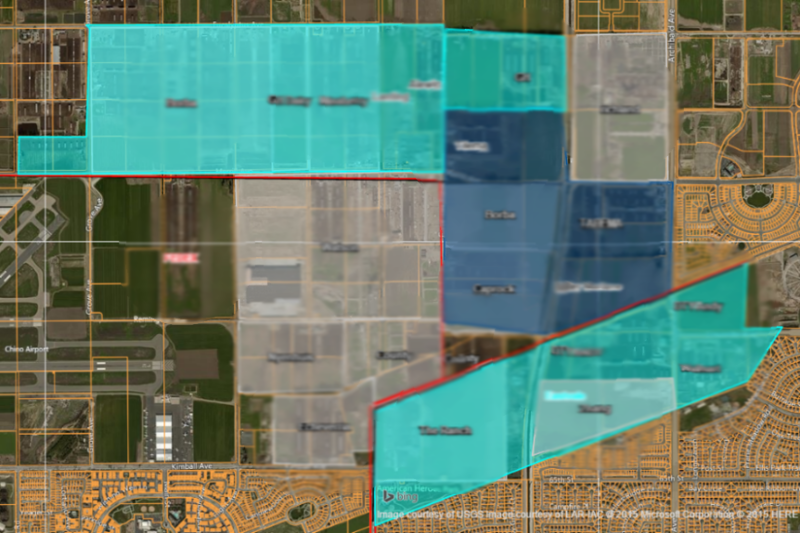 The blue colored parcels is everything zoned industrial in the Inland Empire. It’s a great help when identifying industrial land and buildings. Another interesting feature is the rail lines are colored green so this also makes it easy to locate every large industrial parcel with rail service. 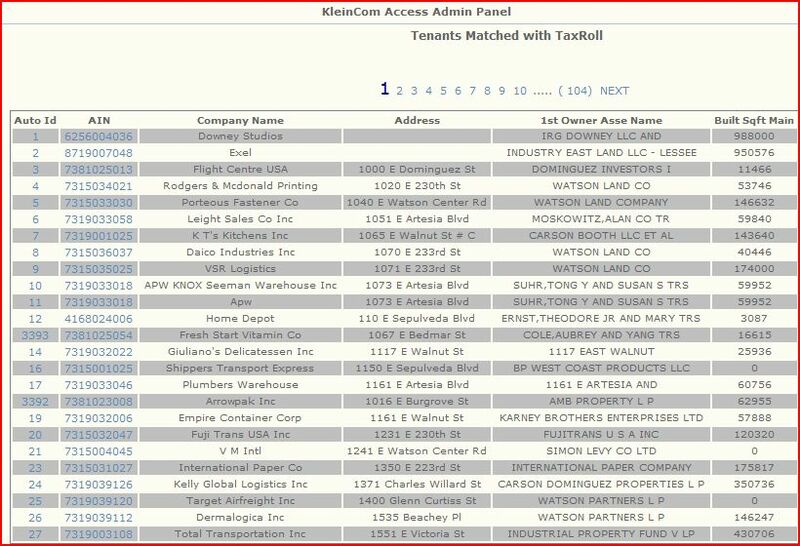 This is a visual example but we can just as easily run a query from our database that provides the same information in tabular form for mailing and calling purposes. Pictured is the Dayton-Hudson warehouse in Fontana. One new feature is geotagging. 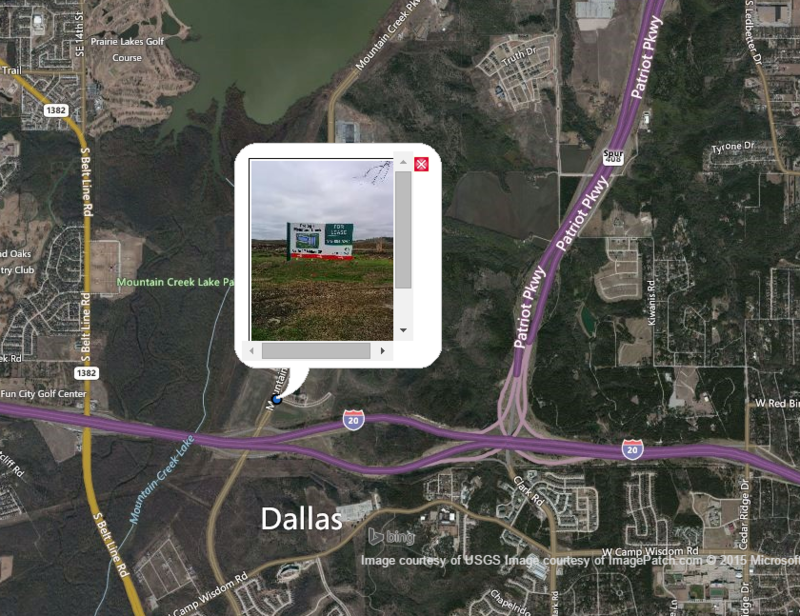 We can take pictures from our cell phone and it automatically places the location information on the MAPP view. After a day of looking at sites, the photos created serve as an excellent reference of what we saw and acts as a reminder of properties that require further investigation. Not only can we geotag when we are in the field, but we can also place collateral information (photos, flyers, site plans) from anywhere at the proper locations. For example, in Perris, CA, the blue markers show the geotagged locations with a thumbnail of a new building. We’ve developed a GIS mapping program for Los Angeles commercial real estate. We call it MAPP for Map App. It’s available for exclusive clients. By combining different databases, aerials, parcels, zoning, and other important property attributes we give a complete spatial view of the Los Angeles County property market. The initial focus is on industrial and infill land sites. MAPP will ease the search for property and help fill empty buildings. Because the program has been written in MYSQL we can operate it from any computer like any cloud-based platform. It’s great to use in the field. But the power comes from its ability to search and query. For example, if there is a vacant building of 50,000 square feet, we can know and show with confidence that we have contacted every possible tenant. For companies searching for specific properties, we can find every off-market site that meets the customers requirement. 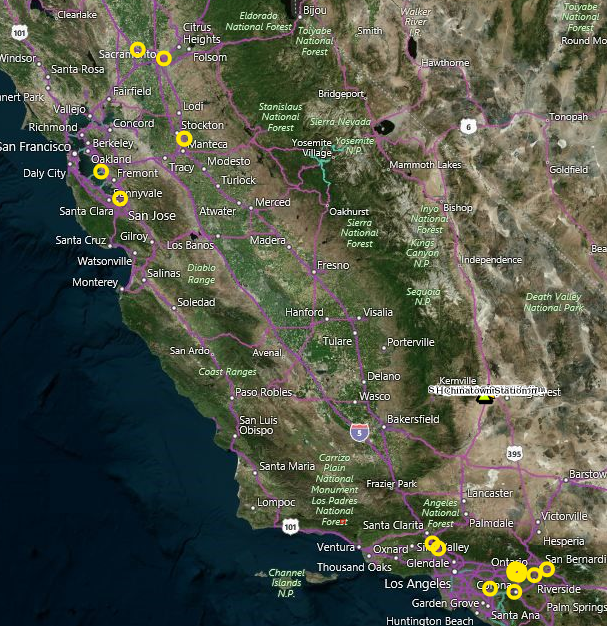 Currently we are identifying every rail-served building in Los Angeles County. For land developers, MAPP is particularly useful. We update the program frequently with our programmers but the best feature is we are able to customize MAPP so it can have a have a specific client focus depending on the need. Below is a screen shot of the Carson area that shows real estate attributes and several special criteria we use for identification. On the left we have layers for zoning, redevelopment areas, city boundaries, rail service, and high density development areas. Running separately is the actual database that powers MAPP. It’s the power of the relational database that makes this program effective and versatile. We are still learning what MAPP can do, but the important thing is what it can do for you. The backend of the MAPP program is run by a MYSQL database that contains all owner information for Los Angeles County, tenants in the markets we work, and available property. When we mash up the data by AIN number, you get some interesting results. For instance, owners of every property, square footage of every tenant, location of every property in a TOD zone, or every building that is served by heavy rail. The database is easily searchable by different criteria to customize specific reports. MAPP or the database separately is a great tool to help owners and tenants. When you combine the two, it’s very easy to search for hard-to-find information. Plus the way the program is designed, we can easily write a new script to provide precise results. If combining SQL and GIS was not enough, we can port the entire program to Salesforce to give us the marketing extension. We are already getting great results in our primary business of finding development sites. But the real power comes from taking your requirement and feeding in the criteria that is important to your business. MAPP is particularly revealing for companies that look for multiple sites because as you narrow your preferences, fewer, better results appear. MAPP is a deal finder’s tool. Because I spend time in New York, I wanted to see if the MAPP Program can be used in other cities. 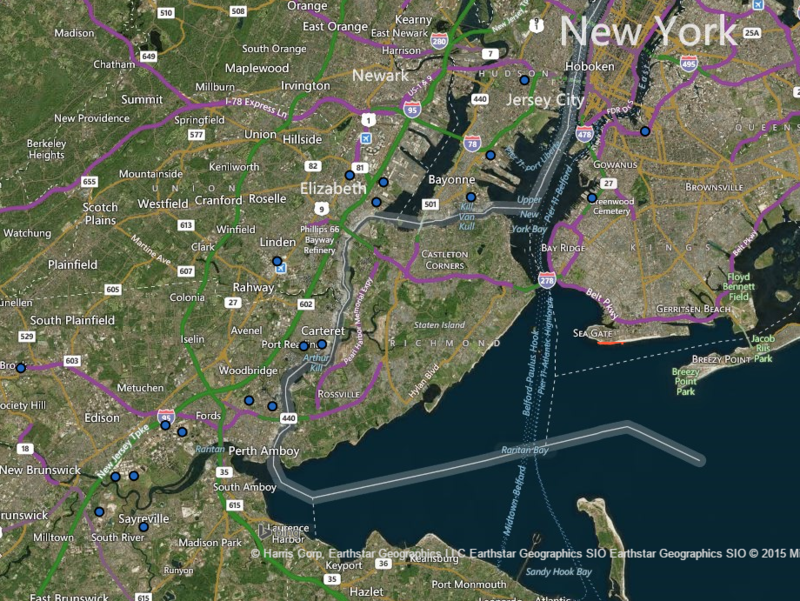 I was able to get the USGS Imagery for New York and New Jersey. 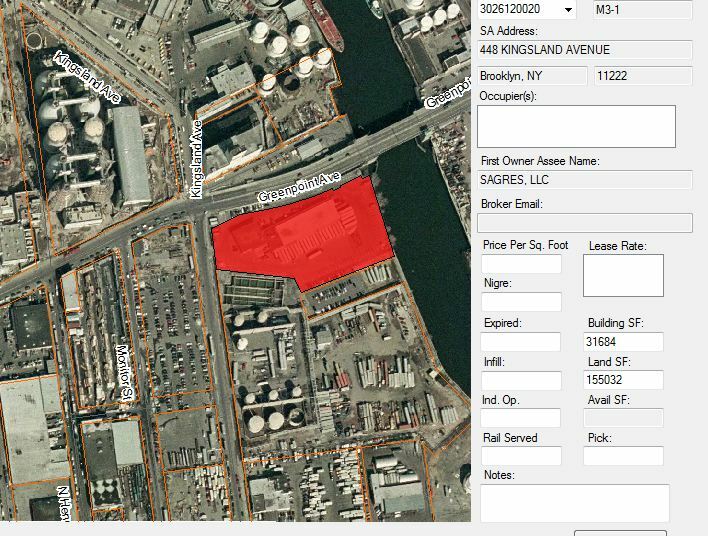 The NYC Planning Department sold me the parcel data and shape files for the five Boroughs. This is a picture of Greenpoint Avenue and Newton Creek in Brooklyn. It covers an old industrial area and the selected parcel is highlighted with the ownership information and other property details. It would be a snap to obtain the tenant information. I think this proves that MAPP can be used in any municipality worldwide if the data is available. Currently there are no plans to make MAPP a commercial product. It is an internal tool that we use for specific customer projects. We have found that customers prefer to see the final query results and they are not as interested in the program workings. We are happy to oblige in screen sharing sessions or in our office.